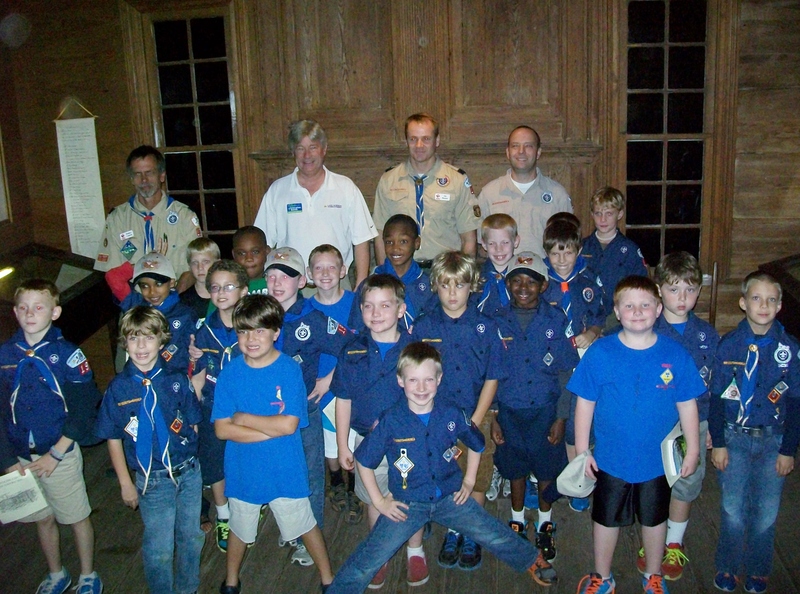 Pack 19, Cub Scouts visited the Hugh Torrance House and Store in Huntersville to gain knowledge and insight into the history of the north Mecklenburg Community. 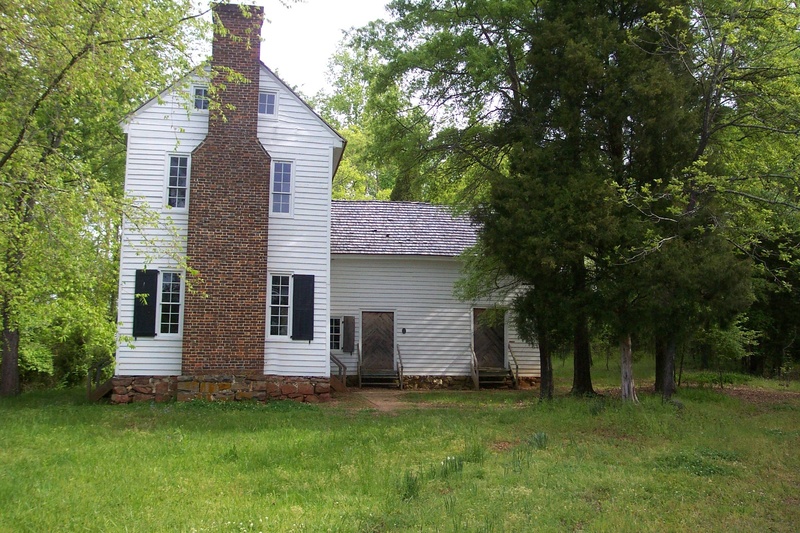 The store, located at 8231 Gilead Road, is North Carolina’s oldest standing store and residence and one of Mecklenburg County’s few surviving 18th century structures. The tour of the historic Huntersville home was led by Torrance Board Chairman and Lake Norman Chamber President Bill Russell. 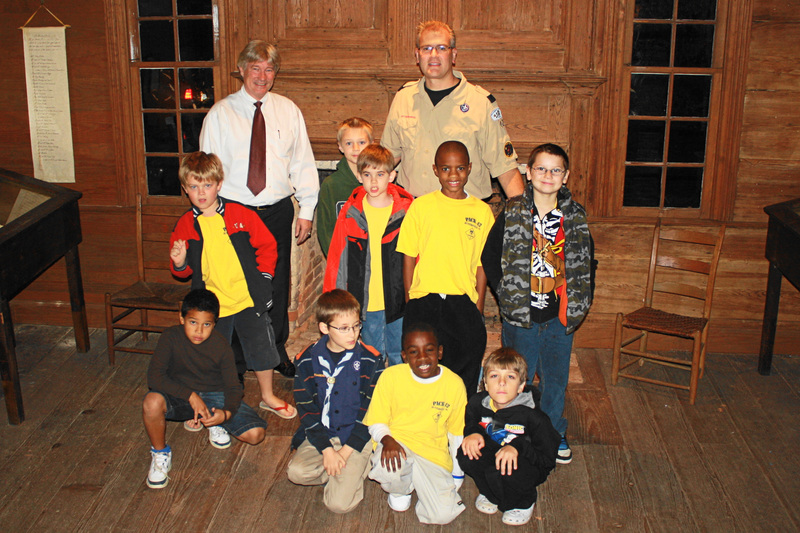 The pack, whose sponsor is Huntersville Presbyterian Church, is comprised of third graders. The unit was established in 1945. 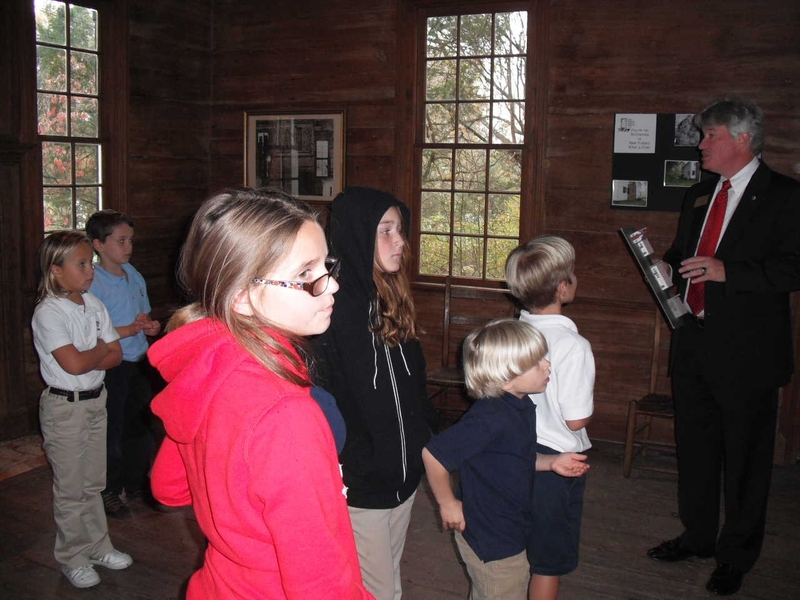 Anyone wishing more information about the historic attraction, or wish to coordinate a group tour, contact Bill Russell at 704-892-1922 or e-mail russell@lakenorman.org. This summer, celebrations are ongoing designating the fifty-year history of Lake Norman. The first ground breaking for Lake Norman took place in 1959. It took four years to complete the Cowan’s Ford Dam and another two years to fill the lake. But the story of Lake Norman actually began much earlier with the Native Americans. The Catawba Indians were the first to settle in our region. They referred to the Catawba River as “The Great River.” Years later, when early European settlers moved to the area, they brought diseases to which the native Indians had no resistance. These diseases nearly wiped out the entire Catawba Tribe. Once numbering 5,000, the Catawbas soon dwindled to less than 400 people. Later, early Colonists slowed the advance of General Cornwallis on grounds surrounding Cowan’s Ford, laying the foundation for later victories that helped gained America her victory from the British Crown. In the early 1890’s, the world’s largest hydroelectric plant began transmitting power from Niagara Falls to nearby Buffalo, NY. Local tobacco magnate James B. Duke and his brother Ben took note that electric power could be the key to their future if they could only harness the power of the Catawba River so they began to buy up land along the Catawba River basin. About that time, the Duke brothers were introduced to Dr. W. Gill Wylie and a young engineer named William Lee. Wylie and the Duke brothers came together to form the Catawba Power Company. One can only imagine the excitement as Wylie, Lee, and the Dukes planned to bring electric power to our region. Huddled around the table in their board room, could they have possibly envisioned what their collective dream would mean to the lake communities we know today? The creation of Lake Norman was not without sacrifice as homes, farms, and entire towns would be flooded to make way for the lake. The Village of Long Island, once a thriving textile town with three mills, would end up under water as would countless other businesses and structures including the old Hwy 150 bridge. In 1957, Bill Lee (the son of William S. Lee) began the feasibility study for what would become Duke Energy Company’s final dam on the Catawba River. This dam would create the largest lake in the Carolinas – our Lake Norman. Now, more than a hundred years later, entrepreneurs are still huddled around tables planning their future. Some with just a dream and a Visa card as they discuss creating a new business. And like their counterparts of a hundred years ago, sacrifices must inevitably be made along the way. Corporations are moving to the lake. Our proximity to Charlotte, transportation infrastructure, and skilled workforce make the area a great place to do business. But make no mistake – it’s the lake that lures them here. 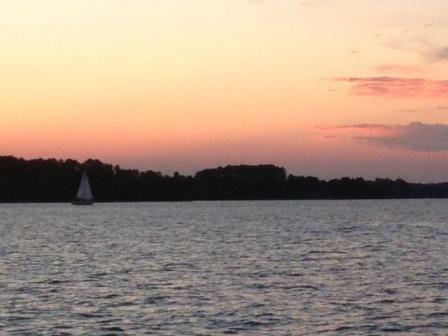 Lake Norman is not just a majestic body of water – it’s a lifestyle like no other. The lake is more than 520 miles of shoreline covering 32,500 acres. It is the spirit of the Catawba Indians who settled here first and who recognized then, that God had already been here. It’s the colonial settlers who stood up to tyranny providing “a hornet’s nest” of rebellion. It’s the dreams that spoke boldly of intentions and the actions which were bigger than the dreams. What began as a vision to power a business has become an energy that surges through time, touching lives, and leaving a legacy of leadership. 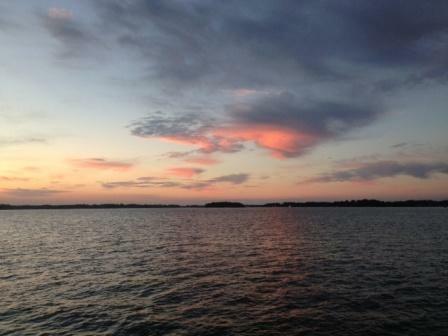 Lake Norman was created to bring energy to the Charlotte region and. fifty years later, its wake has powered a community. Bill Russell is the President & CEO of the Lake Norman Chamber of Commerce with 950 business members serving the Cornelius, Davidson, Huntersville, and greater Lake Norman region. For more information on the history of Lake Norman, check out Lake Norman Reflections by Bill and Diana Gleasner. Abigail Jennings, a Charter Member of the Lake Norman Chamber and president of Lake Norman Realty Company knew of my interest in history. 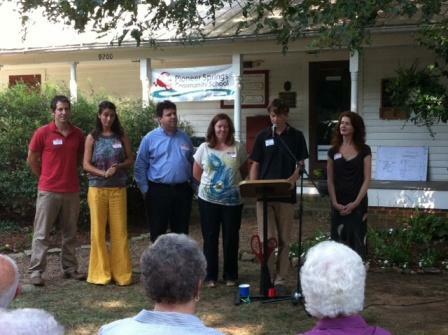 I also serve as Chairman of the Historic Hugh Torance House and Store Board of Directors in Huntersville. The Croft School House, site of the new Pioneer Springs Community School, first opened its doors in 1890 to serve the rural, railroad-centered business district of Croft in North Mecklenburg. It’s been almost 80 years since its closing but I was amazed at how many alumni still turned out to take part in the announcement. Walking the halls of the old school-house last week, I pictured Mrs. Barnette as a little girl. Sitting intently in her chair, listening to her teacher teaching the basic English and math of her day. She and the other students would later be responsible for much of what we know in North Mecklenburg and now Lake Norman. Now eighty years later, those same classrooms will again be a center of learning and once again we as a community will arrive where it all started and we will know the place for the very first time. Sometime in the spring of 1997, I received a call from Rev. Jeff Lowrance of Hopewell Presbyterian Church asking if I would consider joining the Board of Directors of the Hugh Torance House and Store. Jeff knew of my fondness for history as we had both shared stories of our respective Churches. Hopewell Presbyterian in Huntersville has deep roots in Mecklenburg County as does my home Church, Bethesda Presbyterian located in McConnells (York County,SC). My family was among the charter members of the church which was first organized in 1769 with some of the early families meeting as early as 1760. 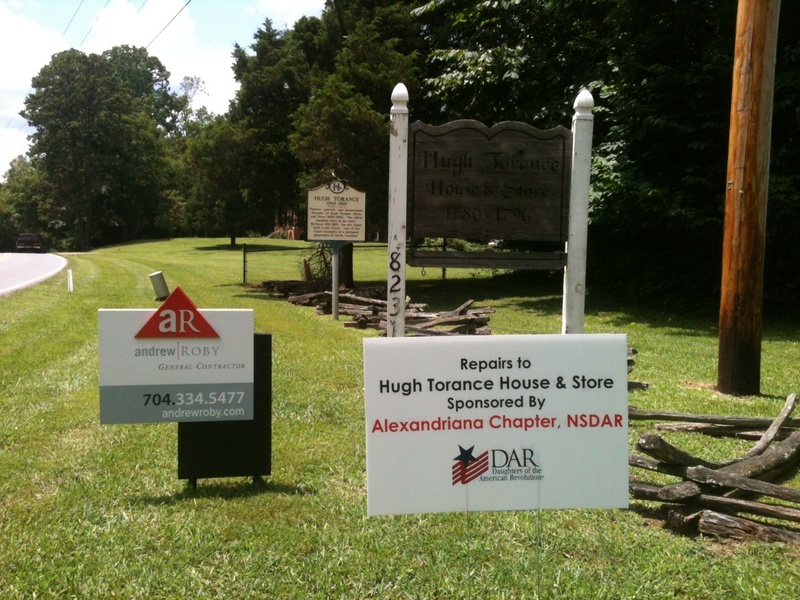 As the president of the Lake Norman Chamber of Commerce, I was intrigued that the Hugh Torance House and Store was the oldest standing store and residence in the state. I was captivated that this old structure was one of the very first retail businesses in North Mecklenburg and once the center of commerce in Huntersville and the surrounding region. 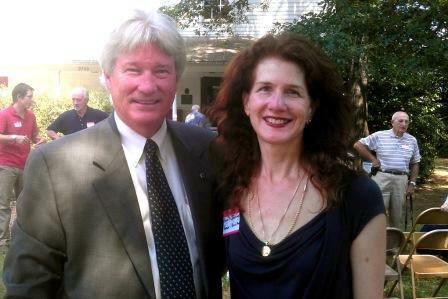 I agreed to sign onto the Board serving as treasurer for a couple of years as Jeff led us on a renovation of the site with assistance from the State of North Carolina, the Town of Huntersville, and a considerable amount of support from local residents, both in North Mecklenburg and beyond. Through the generous support of local contributors, we were able to repair the roof and install new wooden shingles, paint the old wooden sides, and reopen to school groups and residents that summer. Through successful fundraisers we were able to add furnishings and make other needed repairs which allowed us to make the old home and its store more comfortable and visually stimulating to our groups with furniture reproductions and merchandise more appropriate to the time. Sadly we lost Rev. Lowrance a few years ago. However, his spirit of commitment to educating our students and residents about their cultural past lives on in our efforts today. We have a dynamic board of directors and we are always looking for new board members to bring energy and vision to our operations and new docents to share the story of the Torance family with our guests. We are also in the early stages of another restoration process to protect one of our greatest historical assets – The Hugh Torance House and Store. 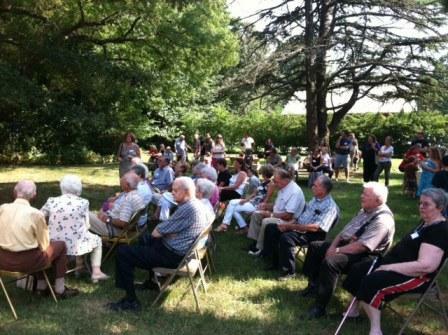 The North Mecklenburg area is fortunate to have historical treasurers like Hopewell Presbyterian Church and its cemetery filled with prominent Mecklenburg County community leaders, the Latta Plantation, the Rural Hill grounds which include the Davidson Family Cemetery and site of the Rural Hill Scottish Festival. 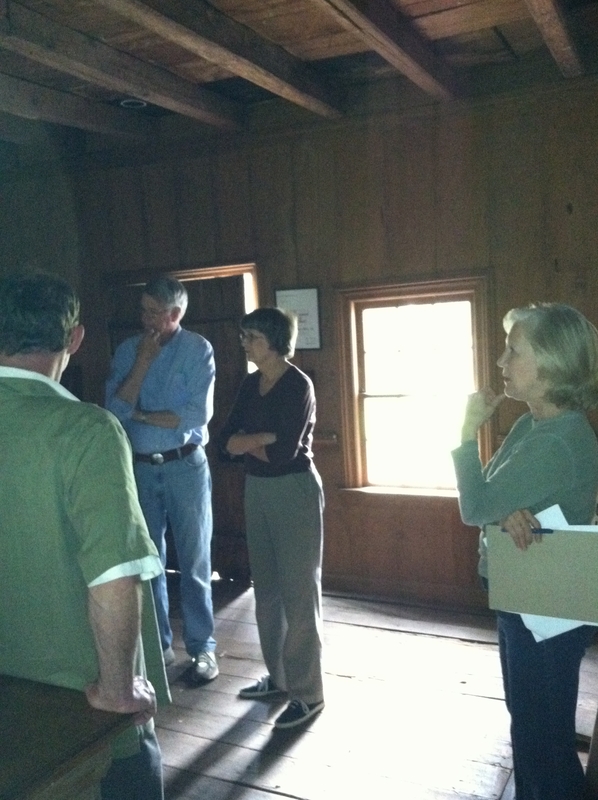 Davidson College and Beaver Dam are also significant cultural and historical treasures as well. Perhaps few have put into perspective our debt to the past better than Jack Claiborne, then Associate Editor of The Charlotte Observer at the formal opening of Hugh Torance House and Store, back on April 22, 1989 after our first restoration effort. “Standing before this splendid restoration, in this lovely setting, it is difficult to imagine the circumstances out of which this old house and store arose. Little in our modern surroundings compares with the environment that existed in 1779 and 1805, when these buildings were constructed. Imagine the isolation of the people who lived here. There was not another farm for miles. They had little idea where they were in relation to the rest of North Carolina, much less the American continent. Most of them never heard of the Mississippi River or the Pacific Ocean. There was no electricity; no telephone and no telegraph. Steam engines had been invented but were yet to be harnessed to ships. Railroads were still 50 years away. Homes and barns were lighted by candles and heated by fireplaces. Communication was by mail, which was slow and uncertain. A courier from Charleston or Philadelphia might take weeks to arrive. The only means of travel was by foot or on horseback. Only the very wealthy had carriages. And the roads were unpaved, unmarked – and unlit. The nearest newspaper was The North Carolina Mercury, a weekly published at Wilmington. It hardly contained the latest dispatches. Ships arriving from Europe brought news that was already at least three weeks old. It wasn’t until 1824 that Mecklenburg County had a newspaper of its own. Yet this was a newsy age. The American Revolution, mired in stalemate up north, was moving south. 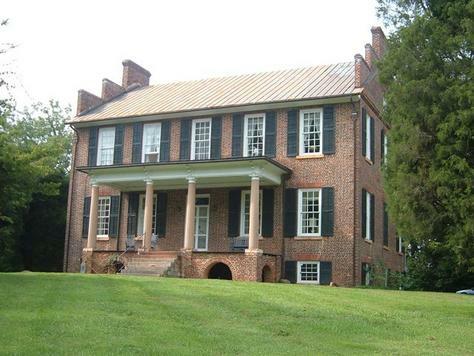 A year after acquiring this property, Hugh Torance faced the British in a number of Carolinas engagements. In September, 1780, Lord Cornwallis and his Redcoats marched on Charlotte and met a “hornets’ nest” of rebellion. The British and Tory defeat at Kings Mountain 11 days later and at Cowpens that winter marked the beginning of the war’s end. In the spring of 1781 Cornwallis led his bleeding army into Virginia in search of reinforcements and supplies. the richest soils lay. 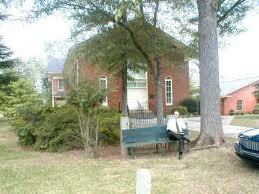 That’s where early settlers built the county’s seven original Presbyterian churches. The town of Charlotte was a crossroads, with maybe 200 inhabitants. It would take the discovery of gold and the 1837 opening of the U.S. Mint to put it on the map. Between 1780 and 1800 the town contained a few stores, an inn and tavern, a courthouse and market, and little else. It was looked down upon by farm people as a corrupt and indecent place. 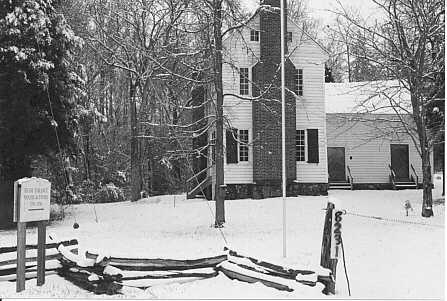 This area of North Mecklenburg, known as the Hopewell community, was home to some of the county’s wealthiest, best educated families, including that of James Latta, a merchant and planter who traveled back and forth to Philadelphia, peddling wares, and at the turn of the 19th century built a plantation house near Hopewell Church. In establishing this store, Hugh Torance bought much of his stock from Mr. Latta. The isolation of farm life and the absence of a post office made the church and country store places that people gathered to exchange news and assess current events. This store was no exception. Its owners often traveled south to Camden, Cheraw and Charleston or north to Roanoke and Philadelphia, and returned with merchandise and news. Their wares were things people couldn’t grow on their own land or make themselves. Bills of sale indicate that Hugh and James Torance sold salt, brown sugar (there was no white sugar), coffee, tea, pepper and other spices. They also sold tools – plows, scythes, sickles and rakes – which were in short supply. So were kitchen and household utensils: pots, pans, knives, forks, china, glass and paper. Accessories for spinning and weaving cotton and wool were popular, as were scissors, needles, pins, buttons and hooks for sewing. Wealthier families went to the store for fine cloth and hats, both men’s and women’s. But shoes, boots, saddles and other leather goods were usually made on the farm or bought from local craftsmen. So were tables, chairs and other furnishings. Over the years Hugh and James Torance also sold whiskey and brandy, perhaps from their own stills, as well as port wine. Presbyterians did not object to distilled spirits nor the moderate consumption of them. To finance an early college in the county, they taxed locally produced whiskey. The store’s ledgers also indicate there was little currency in circulation. Most commerce was on the barter system. The Torances often paid suppliers in butter, tallow, bees wax, wool or cotton. 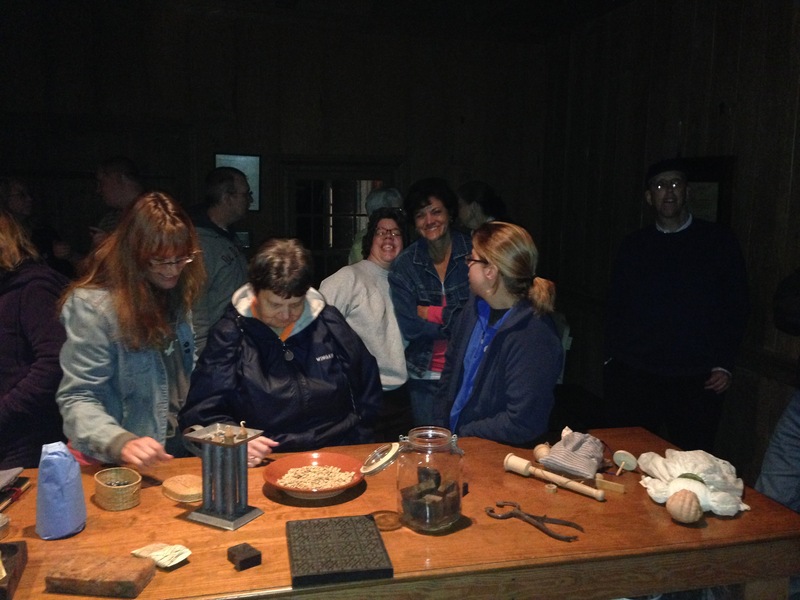 In turn, they allowed their custorners to pay in farm products and homemade goods. The family names of many of those customers are still prominent in North Mecklenburg: Alexander, Kerns, McConnell, Davidson, Hunter, McKnight, Henderson, Osborne, Johnston, Caldwell, Potts, Abernethy, Beard, McAuley, Knox, Wilson, Monteith, Barnette and Sadler. But many others left in search of better fortune. Though land here was cheap and fertile, there was little money and less opportunity. People who owned property did well, but those struggling for a toehold in the economy were often daunted. Mecklenburg County – like the rest of North Carolina – was tightly controlled and highly conservative. Only the wealthy could vote or hold public office. As a result the state exported almost as many people as it did goods. Families streamed west into Tennessee and Kentucky, and south into Alabama, Mississippi, and Texas, where laws were less oppressive and the propertied less entrenched. Among those who left were Andrew Jackson and James K. Polk, both of whom became presidents of the United States. Others became governors, congressmen, senators – in other states. The 11,000 residents of Mecklenburg in 1790 had declined to 10,000 by 1800, despite a birth rate that often produced seven children per household. Even so, economic conditions were changing and opportunities were slowly improving, thanks to three revolutionary developments. The first was the discovery of gold in 1799. Initially the ore was found in streams and shallow “placer pits” in woods and meadows. There wasn’t much of it but it was at least a source of hard money. Hugh and James Torance rented lands on which to prospect for gold in the early 1800s.By the 1820s gold was being deep-mined on the outskirts of Charlotte and in surrounding counties. That brought miners and engineers from around the world. It also brought the U.S. Mint and the beginnings of today’s banking center. The second revolutionary development was the discovery of iron ore across the Catawba River in Lincoln County. That led to the establishment of three furnaces – Vesuvius, Mount Tirzah and Rehoboth – and the manufacture of tools that previously had to be ordered from distant places. Farmers clambered to the forges with wagonloads of wool and cotton, which were exchanged for plows, tools, pots, hinges and other hardware essential to raising the standard of living. Like gold, the iron ore quickened commerce and enabled many families to begin accumulating wealth. remained one well into the 20th century. Previously, cotton was grown for home consumption. The cotton gin made it a cash crop. Ginned cotton was pressed into 350 to 400 pound bales, loaded on wagons and hauled to market on muddy roads – either south through Charlotte and on to Camden, where it was loaded on barges for the trip down river to Charleston, or east through Wadesboro to Cheraw, and from there down river to Georgetown, SC. Slavery was here before cotton, but cotton promoted its increase and enabled planters to accumulate great wealth. Slaves helped Hugh Torance get rich. At his death in 1816. he left his son James the house, the store, 1,400 acres nearby, 3,800 acres in Tennessee, 51,500 in cash and 33 slaves. wasn’t long before that changed. shifted the focus of commerce from country stores like this to cities such as Charlotte. A railroad from South Carolina arrived in Charlotte in 1852 and the N.C. Railroad came 1856, spurring Charlotte’s growth. By 1860, the crossroads of 200 residents had swelled to a town of more than 2,200. That left country stores like this one to wither and decay. James Torance must have seen the shift coming. In 1825, he sold his entire inventory to Charlotte merchant Samuel McComb and got out of the mercantile business. He died in 1847 leaving an estate of 3,200 acres and 109 slaves. Fortunately for Mecklenburg County, his store remained in the family and is now the oldest commercial structure in the county. Through the care and sacrifice of Richard Banks, James Torance’s great grandson, it was preserved and now has been restored to tell its own story. 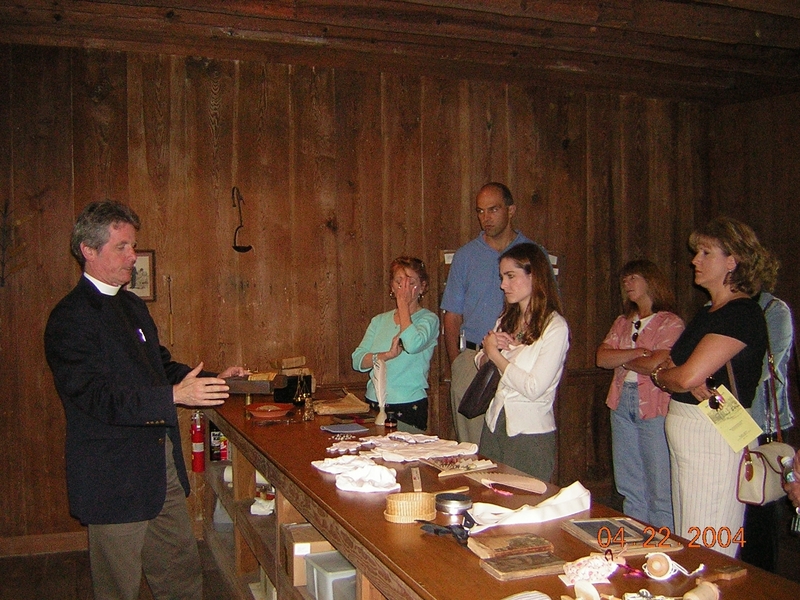 As Chairman of the Board of the Hugh Torance House and Store, I invite you to tour the store open on the first and third Sundays 2:00 – 5:00 pm from April through October. We can also accommodate group requests. You can reach me at russell@lakenorman.org or call the Lake Norman Chamber of Commerce at 704-892-1922. If you are interested in a role as a volunteer or perhaps interested in taking a position on our Board of Directors of the historical association, please contact me. I also hope you will join in our efforts soon raising funds for our upcoming capital campaign.